On November 25, 2012, a very rare coin from the Warring States period (475-221 BC) was sold at auction by the Beijing ChengXuan Auctions Co., Ltd (北京诚轩拍卖有限公司). The coin sold for US$591,000 (RMB 3,680,000) which set a new world record for an ancient Chinese coin. The coin, shown at the left, is known as a “three hole spade” (san kong bu 三孔布) which is a type of money that evolved from an ancient farming implement similar to a shovel. 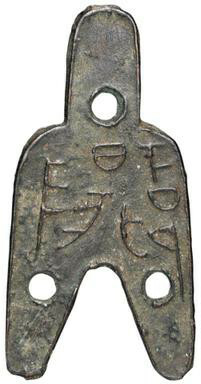 While similar forms of spade money with a round “handle”, round “shoulders” and “round” feet were produced by several of the Warring States, this particular type of spade money is quite distinctive because it has “three holes” with one each in the “head” and the two “feet”. Three hole spades are so rare that it is unlikely that you will ever see an authentic piece outside of a museum. Many are one-of-a-kind with some varieties being only fragments. The National Museum of China in Beijing and the Shanghai Museum have several specimens. The Bank of Japan Currency Museum in Tokyo also has an outstanding collection. Most of the other known examples are in the hands of private collectors outside of China. This particular three hole spade has a very well-documented provenance. Its first documented appearance was about 200 years ago when it became part of the collection of Zhang Tingji (张廷济), a famous artist and epigrapher (1768-1848) of the Qing Dynasty. A rubbing of this specific coin appeared in his “Ancient Coin Rubbings” (古泉拓本) which made it the first three hole spade to ever appear in publication. During the Republican era (1912-1949), the coin was obtained by the famous Chinese coin collector Zhang Shuxun (张叔驯) and the rubbing of this coin has appeared in almost every Chinese coin catalog published since then. The Chinese characters on the obverse side are xia qu yang (下邲阳). Xia qu yang is believed to have been a city located in what is now Ningjin Prefecture (宁晋县) in Hebei Province (河北省). The inscription on the reverse side of the coin is believed to be shi qi liang (十七两). The shi qi, written on the handle, translates as “17” and the denomination of the coin is one liang or “tael”. Three hole spades come in two sizes: the “large” ones are about 7.2 cm in length, 3.8 cm in width and weigh approximately 15.8 grams. The “small” three hole spades, which have a denomination of half liang (12 zhu (朱)), are about 5.2 cm in length, 2.7 cm in width and weigh approximately 8.2 grams. This particular spade has a length of 7.35 cm, a width of 3.7 cm and a weight of 13.4 grams. There is some controversy as to which state actually cast these coins. They are believed to have circulated as money in what is now eastern Shanxi and Hebei during the end of the Warring States period. Some experts believe the coins were cast by the State of Zhao (赵). Others believe it was Zhong Shan (中山). Still others believe it was the State of Qin (秦). Based on archaeological digs as well as the names of the cities identified from the inscriptions on these coins, the strongest evidence is that they were cast by the State of Zhao. 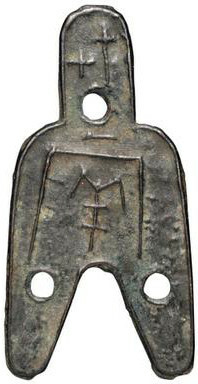 Three hole spades are also noted for using the denomination liang (“tael”) and zhu which were the denominations of the coins of the State of Qin. For this reason, these coins are believed to have been produced in areas under Qin’s influence but prior to the unification of China under the Qin Dynasty in 221 BC. Based on specimens appearing in coin catalogs dating back to the Qing Dynasty (1644-1911), there are believed to be more than ten city names used in the inscriptions and a total of more than thirty varieties of this coin. Chinese numismatists remain puzzled as to why a state would issue so many varieties in such small quantities. While there are many very rare and valuable old Chinese coins, this three hole spade, as already mentioned, set a new record for the highest price ever paid for an ancient Chinese coin. It is a testament as to just how rare these three hole spade coins are that the previous record for the most expensive ancient Chinese coin was another three hole spade. The inscription on that coin was wu yang (武阳) and it sold in 2010 at the China Guardian Auction for about US$567,000 (RMB 3,528,000). Have just recently dug up a three hole spade coin and would like to find more information about it. How can I find out about it. Pictures and images of both sides. Authentic three hole spades are really rare. I’ll send you an email requesting the images. Hello, I recently acquired a 3 hole spade coin at a local estate. How can I find out it’s authenticity? I will email you requesting images of your three hole spade. The three hole spade coins are now known with the names of at least 25 different towns. Many of these have only been discovered since 1949 and some are known only from a single example.